Was Miriam Buried at Petra? Numbers 20:1 states that the prophetess Miriam died at Kadesh (also known as Kadesh-Barnea) in the Wilderness of Zin. Numbers 13:26 connects Kadesh with the Desert of Paran instead. For at least 2,000 years writers have speculated where this site is located and if there are two places known as Kadesh. “A very few modern scholars have claimed that there were, indeed, two sites by the name of Kadesh. However most have assumed that there was, in fact, only one Kadesh” (Levin, p. 65). Modern scholars almost universally identify Kadesh-Barnea as Tell el-Qudeirat in northern Sinai. Starting in the 1800’s explorers visited this area and came to the conclusion that it was the ancient site of Kadesh. T.E. Lawrence (aka Lawrence of Arabia) who also visited the Tell, popularized this conclusion. He concluded (along with others) that due to the abundance of springs in the area, it was the only logical place that could support a large group of people fleeing Egypt. Unfortunately, the explorers and early archaeologists who agreed with each other didn’t stop to consider that there were other well-watered places in the vicinity of the ancient land of Canaan. “The earliest remains on the site derive from the 10th century B.C.E. the age of David and Solomon. In the Bible, however, Kadesh-barnea is connected with the much earlier epoch of Moses and the 40-year wandering. This is an apparent inconsistency, and it should be asked if the excavations at Kadesh-barnea have contributed, in one way or another, to the understanding of Israel’s early traditions…. Although the author is convinced that the site of Tell el-Qudeirat is Kadesh-barnea, documentary evidence is lacking” (Cohen, “Did I”). Cohen hopes that if they keep digging eventually they might find something to identify conclusively that this was the biblical site of Kadesh-Barnea. After reviewing the archaeological reports, I find no evidence linking Kadesh-Barnea with Tell el-Qudirat, despite the scholarly consensus that the two are identical. I think Lawrence of Arabia’s opinion on the subject has been overly influential. 1) Tell el-Qudirat is located within the ancient boundaries of the “Promised Land” based on the description of boundaries in Joshua 15:1-4 and Numbers 34:3-5. Since the Israelites reportedly weren’t allowed into the Land until the conclusion of 40 years, how could one of their camps be set up within the borders? Admittedly, the biblical descriptions of the boundaries of the land of Canaan are difficult to decipher so I’ll let this one slide. 2) The ancient historian Josephus wrote in 110 C.E. that Kadesh-Barnea was located at Petra. “Then it was that Miriam, the sister of Moses, came to her end, having completed her fortieth year since she left Egypt, on the first day of the lunar month Xanthicus. They then made a public funeral for her, at a great expense. She was buried upon a certain mountain, which they call Sin; and when they had mourned for her thirty days … Now when this purification, which their leader made upon the mourning for his sister, as it has been now described, was over, he caused the army to remove and to march through the wilderness and through Arabia; and when he came to a place which the Arabians esteem their metropolis, which was formerly called Arce, but has now the name of Petra, at this place, which was encompassed with high mountains, Aaron went up one of them in the sight of the whole army, Moses having before told him that he was to die, for this place was over against them” (Antiquities 4.82-83). Of course Josephus didn’t go on the Exodus adventure but he might have been privy to traditions about the location of Kadesh-Barnea passed down through the generations. 3) Eusebius of Caesarea wrote a dictionary of geographic places in 325 C.E. called the Onomasticon. Therein he locates Kadesh-Barnea in the area of Petra. “Kadea Barne. The desert which extends to (the city of) Petra a city of Arabia. There Mariam went up and died, and there the doubting Moses struck the rock to give water to the thirsty people. The tomb of Mariam herself is pointed out there even now” (Eusebius). Again, he didn’t have first hand knowledge of the location but he did have access to ancient documents and oral traditions that we no longer have access to. 4) Kadesh-Barnea was on the border of Edom (Num. 20:16) in the Transjordan. Petra is certainly in the region of Edom (see map, MacDonald, p. 295). Tell el-Qudirat is not even close to the border of Edom. 5) Kadesh-Barnea was in the Wilderness of Zin (Gen. 14:7; Num. 13:3-26; 14:29-33; 20:1; 27:14; cf. Deut. 1:46). The Anchor Bible Dictionary’s entry on Zin is of no use. It states that because Kadesh-Barnea was in Zin, and because Lawrence of Arabia identified Kadesh-Barnea with Tell el-Qudirat, then that’s where the Wilderness of Zin was. Yeesh. You can see why Lawrence is being cited a bit too heavily, in my opinion. Numbers 34:3 states that the Wilderness of Zin was along the border of Edom which was clearly in the Transjordan area, not the Sinai Peninsula. 6) Kadesh-Barnea was in the Wilderness of Paran (Num 13:26). Again, The Anchor Bible Dictionary uses Lawrence to identify this biblical location. Same circular argument. Eusdebius in his Onomasticon entry for Paran (Pharan) reported that Paran was a city in Arabia. Some contemporary scholars also identify Paran with the Transjordan region, see for example Shehada, p. 90. By the way, this is also where Abraham exiled Hagar. 7) Petra and the surrounding areas were inhabited since 7,000 B.C.E., including the time of the Exodus (Petra National Foundation). 8) There are many attestations to the wealth of water that was once available at Petra, including the ancient writer Strabo who wrote in 15 C.E. (Geography 16:4:21). That’s a long enough list of reasons to not go along with the crowd of scholars who think Kadesh-Barnea was located on the Sinai Peninsula. So now when I look at the pictures I took in Petra, I see them through the lens of a biblical prophetess named Miriam. 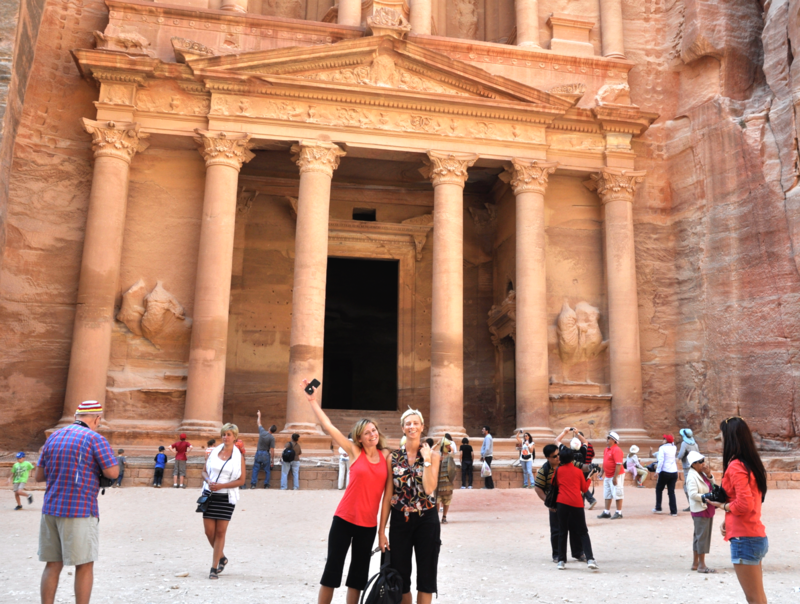 Petra is an exciting place and it just got even better for us women of the Bible freaks. Cohen, Rudolph – “Did I Excavate Kadesh-Barnea?” Biblical Archaeology Review 7.3 (1981) 20-33. Hacohen, D. – “Kadesh and Rekem, Kadesh-Barnea and Rekem-Geah,” in Y. Eshel, ed., Judea and Samaria Research Studies 11 (Ariel, 2002), 25–40 (Hebrew with English abstract). Levin, Yigal – “Numbers 34:2-12, The Boundaries of the Land of Canaan, and the Empire of Necho” Journal of the Ancient Near Eastern Society 30 (2006) 55-76. MacDonald, Burton – “Archaeology of Edom” The Anchor Bible Dictionary, David Noel Freedman, ed. Vol. 2:295-301 (Doubleday, 1992). Manor, Dale W. – “Kadesh-Barnea” The Anchor Bible Dictionary, David Noel Freedman, ed. Vol. 4:1-3 (Doubleday, 1992).